One of my most favorite pastimes is to attend fabulous antique shows. 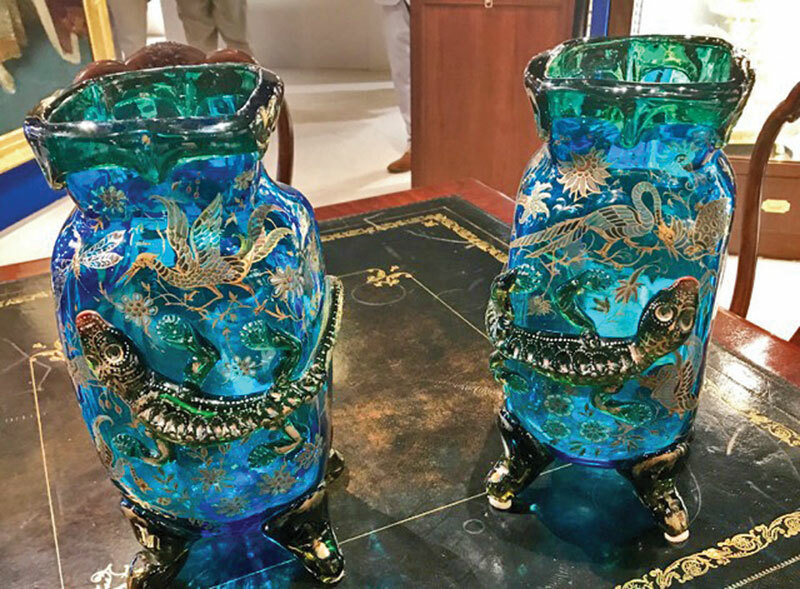 Recently, I was fortunate to attend the preview of the Palm Beach Jewelry, Art & Antique Show with a friend. Hobnobbing with the uber wealthy who are really shopping and not just looking is a great lesson in human nature and commerce. We visited all 175 vendors displaying their remarkable jewels, furnishings, art and objects vertu. I have never seen so much dazzling jewelry in one place outside of the Paris Antiquary show, where they live by the mantra “more is more.” Every fine jewelry designer was represented, from Cartier to Verdura. 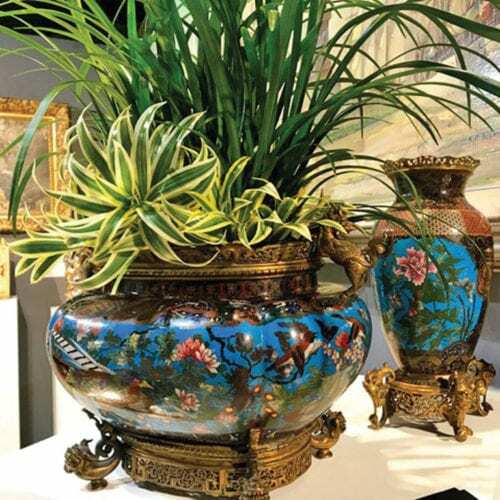 The antique dealers came from all over the world; after all, this is Palm Beach, where the wealthy play. And they were playing, or should I say buying! I stopped in the French-paneled Steinitz space. Bernard Steinitz, who was known as the ‘prince of dealers,’ died several years ago, and his son Benjamin now runs the company. The shop, located at 77 Rue Du Faubourg in the 8th arrondissement in Paris, specializes in 17th- and 18th-century furnishings. 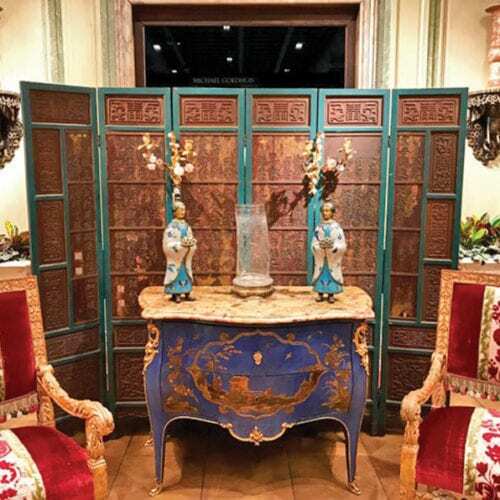 Being a lover of all things chinoiserie, I inquired about a lovely blue French commode with gold Chinois decoration. I was stunned to hear that within the first hour of the show, it was on hold—and a bargain at $990,000! Well, maybe next time, if they will take a postdated check. 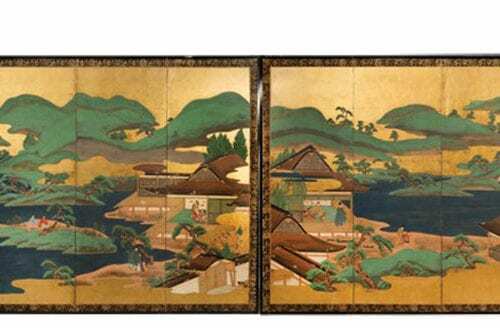 19th century Japanese decorated screens. French Japonisme Cloisonne enamel garniture. 1900 Auguste Jean French hand-painted blue glass vases. Biscuit jars dating from around 1880-1890. 17th century collector’s cabinet from Hamilton Palace. Blue French commode with chinoise decoration. 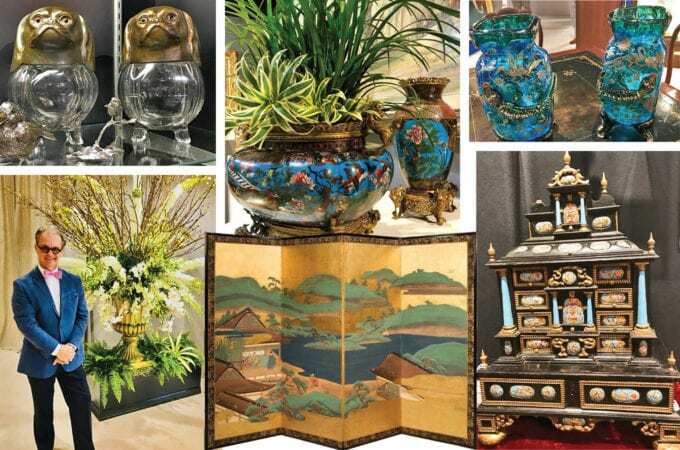 For either the design professional or the novice, these shows are a wonderful opportunity to learn about antiques in a very personal way. 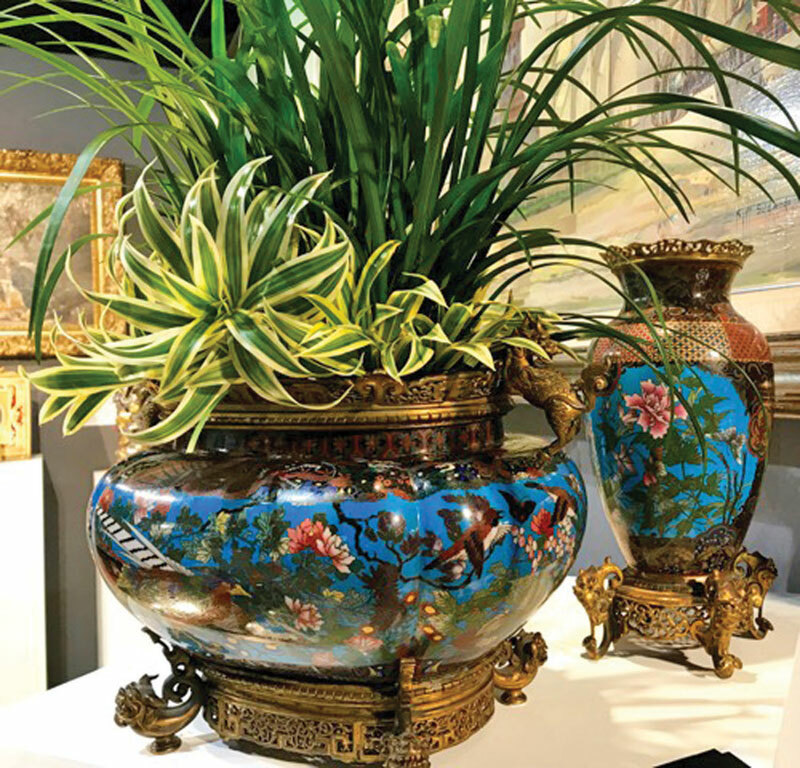 Dealers love to share their knowledge of the history, construction and ownership of pieces they are offering for sale. We stopped at William Cook’s booth, a dealer located across the pond in London. His showstopper was a very rare pair of 19th-century Japanese decorated screens. They were in excellent condition and had the original silk fabric border. 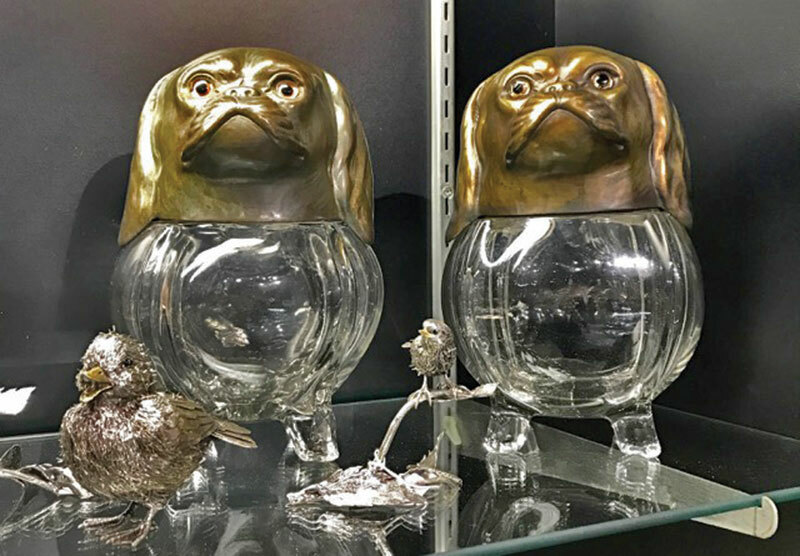 These were being offered at $50,000, and honestly, they were worth every penny. Exquisite! 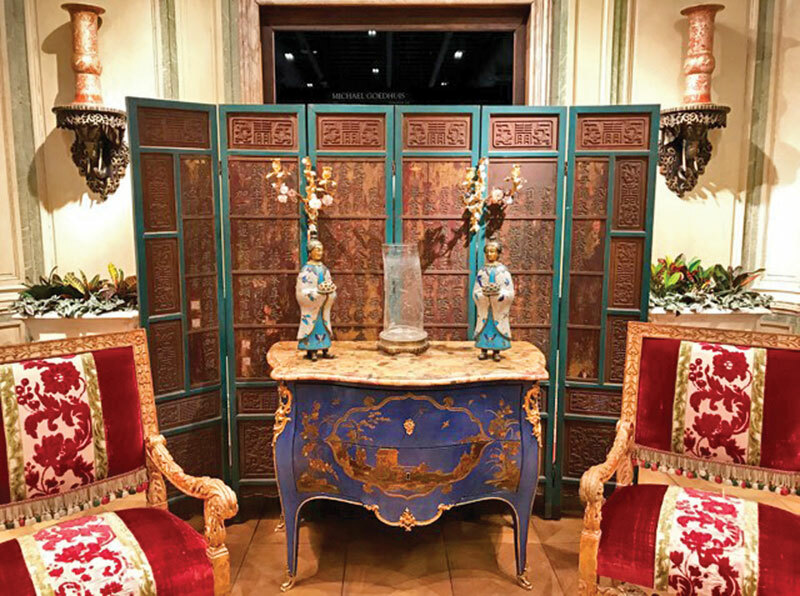 Among many other unique and rare finds, the European Decorative Arts Company showcased a 17th-century collector’s cabinet from Hamilton Palace that once stood in Scotland. 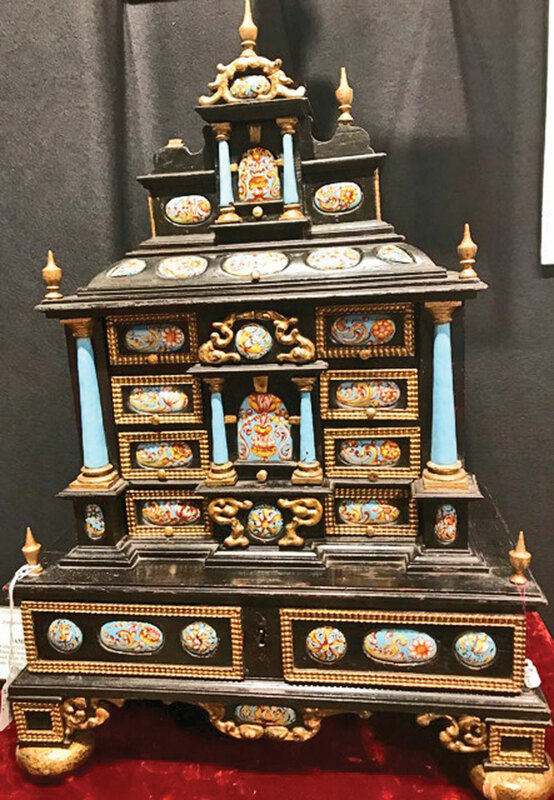 Consisting of ebonized and gilded wood with 35 decorative enamel on copper plaques and blue enamel pilasters, it is a whimsical cabinet for the collector who has everything. The plaques are all decorated with Holland’s flower, the tulip. 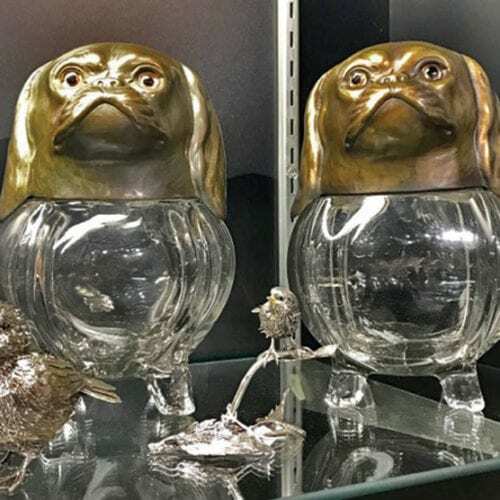 Other items of interest were a unique pair of biscuit jars dating from around 1880-1890 made of crystal with copper puppy heads. They were somewhat affordable at $4,400. M.S. 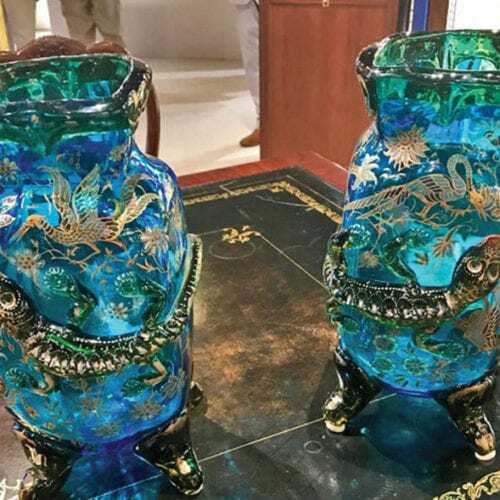 Rau offered a pair of French hand-painted, blue glass vases by Auguste Jean from 1900 that had several zeros attached to the price. 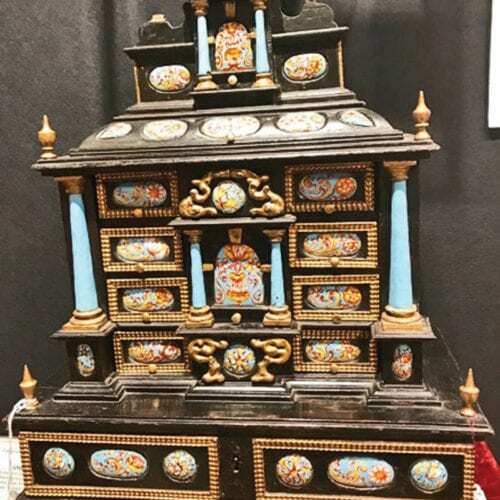 If cloisonné is your collection of choice, a mounted, French Japonisme, bronze, three-piece, cloisonné enamel garniture was available through Solomon Treasure for only $12,500. The trio once belonged to Richard Bass of the famed Bass brothers in Texas, so provenance counts. To educate yourself about things of beauty is a marvelous way to spend an evening. I hope you are inspired to appreciate the incredible craftsmanship that surrounds you on a daily basis. You just have to look for it!